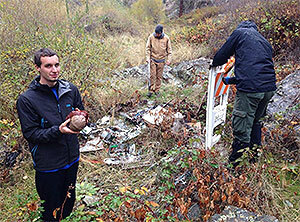 REDDING, Calif. - Simpson University students organized a recent cleanup along the Shasta River as part of a class on ecotheology, faith, and practice. The four students traveled north of Yreka off Highway 263 on Oct. 30 and worked with a U.S. Forest Service ranger from Happy Camp, who had provided several options for the cleanup, including possibly rafting to places where car axles had been dumped in the river. The students instead traversed up and down a 100-yard stretch of shore and picked up several hundred pounds of trash that had been tossed from a bridge. The cleanup met a requirement for an assignment in a Simpson CORE class called “Jesus and Aldo Leopold: Ecotheology, faith, and practice.” The class is team-taught by Amy Smallwood, associate professor of outdoor leadership, and Dr. Michael Lyons, associate professor of Old Testament. Simpson’s signature CORE classes, required of all students, are designed to teach students to engage in cross-disciplinary dialogue as they confront issues facing the current generation. Along with Salgado, the other students who participated in the cleanup were Moriah Stock (outdoor leadership), Caleb Heatherly (outdoor leadership and cross-cultural studies), and Kayla Holland (biology). Standing, from left, Moriah Stock, Cassidy Moran (Southern Oregon University student), and Caleb Heatherly; and (seated) Nick Salgado and Kayla Holland with trash gathered after a day of cleanup along the Shasta River. From left, Caleb Heatherly, Cassidy Moran (Southern Oregon University), and Nick Salgado pick up debris along the shores of the Shasta River.